Here at NBC Washington's Around Town, we like to focus on the things happening... well, around town. (Go figure.) But here's something that's going on way, way, WAAAAY out of town: The first total lunar eclipse in two years is happening tonight and into tomorrow morning. Purely by chance, it's coinciding with the winter solstice, which is the shortest day of the year. And the last time this happened was in 1639 -- when Galileo himself was alive. Unfortunately, he'd gone blind two years earlier because he'd spent too much time looking at the sun through the telescope he'd invented, so he didn't get to watch the eclipse for himself. The next time a total lunar eclipse will coincide with the winter solstice will be in 2094, so we'll leave that one for the grandkids. As for tonight, North and Central America and a tiny sliver of South America will have the best view. Weather permitting, skygazers should be able to view the entire eclipse, expected to last three and a half hours. The moon, normally lit by the sun, will pass through the shadow created by Earth, which will block the sun's light from reflecting on the moon. The partial eclipse will begin at 1:33 a.m. The total eclipse starts at 2:41 a.m. and will last a little over an hour, ending at 3:53 a.m. 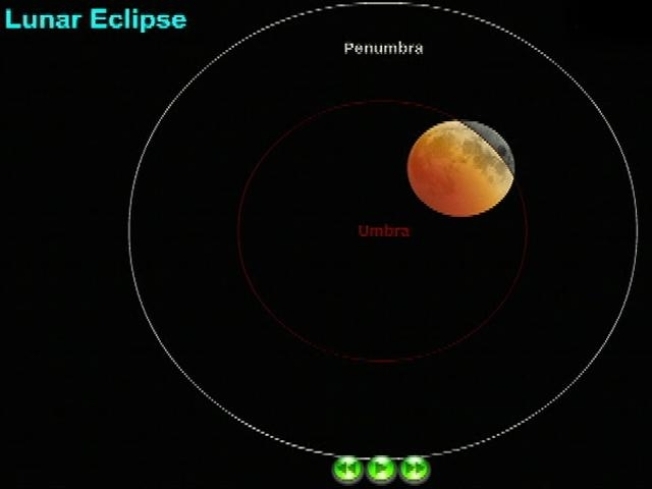 The partial eclipse will then end at 5:01 a.m. If this sounds a little confusing to you, check out this handy diagram here, or watch an animation here. Lunar experts from NASA's Marshall Space Flight Center will be chatting live online about the eclipse, first from 3 to 4 p.m. and then from midnight to 5 a.m. Tuesday. You can also check out their Flickr group here. Our own, um, "expert" advice? Make sure you grab an extra-large coffee tomorrow morning. You're gonna need it. And if you need a sountrack, try this classic, the literal video version of Bonnie Tyler's "Total Eclipse of the Heart."